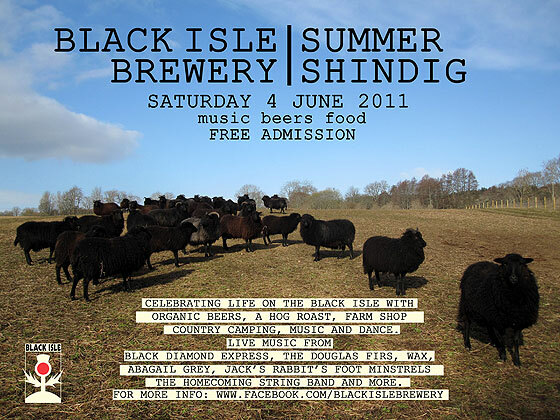 On the 4th of June I will be taking my boyfriend, dog, tent, and cool box down to the Black Isle Brewery Shindig for a hog roast followed by copious amounts of organic Black Isle beer. I thought I might tell you a little bit about their beers before I drink the brewery dry. Organic Goldeneye Pale Ale 5.1% abv – a tangy, hoppy pale ale using sweet floral hops. A refreshing take on traditional pale ale. It is great on keg – the added fizz brings out the hops and gives this beer its edge. Organic Hibernator Export Oatmeal Stout 7.0% abv – I just tried this one a couple of nights ago for the first time and let me just say, wow. This beer is FULL of flavour (treacle, liquorice and forest fruits) and the best thing about it is you can taste the oatmeal. It is sweet, full-flavoured and filling. Apparently the fermentation process is much like that of champagne. Black Isle Organic Red Kite Ale 4.2% abv – I have a soft spot for this beer as it’s the first ale my boyfriend has liked (saying that he drank Black Isle Blonde before, we just gave him a little nudge). This red ale is light and malty with bursts of lemon and orange. A lovely alternative to Black Isle Blonde and other light lagers. Black Isle Organic Vanilla Porter – Black Isle Brewery’s best kept secret. The Tap has been pleading for them to make this for months and months and finally (shhhh though – if we boast too much we might scare them away!) they are going to brew us a batch (or 2). I haven’t had the pleasure of tasting this yet but my colleagues have and according to my American teammate it is “ohhhhh myyyyy gaaaaaad!! !” I’m not sure I will be announcing the arrival of this to our customers…. I want it all for myself mwahh ha haaa. So, if you’re out and about and see Black Isle Brewery beer give it a try, rest assured you will not be disappointed. SAVE THE PLANET, DRINK ORGANIC!